WASHINGTON, Oct 8 2012 (IPS) - In what was billed as a major foreign policy address, Republican presidential candidate Mitt Romney Monday assailed Barack Obama for “passivity” in the conduct of U.S. foreign policy, arguing that it was “time to change course” in the Middle East, in particular. Dispensing with some of the neo-conservative rhetoric he has used in the past, he nonetheless argued that the “risk of conflict in the region is higher now than when (Obama) took office” and that Washington should tie itself ever more closely to Israel. Independent analysts described the speech as an effort to move to the centre on foreign-policy issues, much as he did on economic issues during his debate with Obama last week. As a result, they said, his specific policy prescriptions did not differ much, if at all, from those pursued by the current administration. “In a speech where he attempted to be more centrist, he ended up articulating positions that sound like those of Obama,” noted Charles Kupchan, a foreign-policy expert at the Council on Foreign Relations who teaches at Georgetown University. Indeed, in both tone and policy, the speech marked a compromise between his neo-conservative and aggressive nationalist advisers on the one hand, and his more-realist aides on the other. Absent from the speech altogether, for example, was any reference to making the 21st century “an American Century”, a neo-conservative mantra since the mid-1990s that Romney used repeatedly in his one major foreign-policy address during the Republican primary campaign almost exactly one year ago. The latest speech comes at a critical moment in the presidential campaign. While Romney was lagging badly in the polls in late September, his strong performance in last week’s debate against a surprisingly listless Obama last week has revived his prospects. While Obama had been leading by about four percentage points nationwide before the debate, the margin has since fallen to only two percentage points, while on-line bettors at the intrade website have lowered the chances of an Obama’s victory from nearly 80 percent to 64 percent. Obama’s seeming passivity during the debate may have played a role in the Romney campaign’s decision to deliver a foreign-policy address if for no other reason than that it highlighted the argument that many Republican foreign-policy critics, especially the neo-conservatives, have been building over the past year: that the president’s policies in the Middle East, in particular, have been too passive, and that “leading from behind” – a phrase used by an anonymous White House official quoted in “The New Yorker” magazine 18 months ago to describe Obama’s low-profile but critical support for the rebellion against Libyan leader Moammar Qadhafi – was unacceptable amid what Romney described Monday as the world’s “longing for American leadership”. Indeed, in the wake of last month’s siege of the U.S. embassy in Cairo and the killing of the U.S. ambassador and three other embassy staffers in Benghazi, Romney’s vice presidential running-mate, Rep. Paul Ryan, and other surrogates have tried to link recent displays of anti-U.S. sentiment and Islamic militancy in the region to disasters, notably the seizure of the U.S. embassy in Tehran, that plagued – and perhaps ultimately doomed – former President Jimmy Carter’s re-election bid in 1980. Recalling the U.S. response to a similar struggle in Europe after World War II and invoking then-Secretary of State George Marshall (without, however, referring to the Marshall Plan that poured U.S. aid and investment into Western Europe), Romney argued that Washington should lead now as it did then. “Unfortunately, this president’s policies have not been equal to our best examples of world leadership,” he said, adding, “…it is the responsibility of our president to use America’s great power to shape history – not to lead from behind, leaving our destiny at the mercy of events. “Unfortunately, that is exactly where we find ourselves in the Middle East under President Obama,” he said. “…We cannot support our friends and defeat our enemies in the Middle East when our words are not backed up by deeds, …and the perception of our strategy is not one of partnership, but of passivity. “It is clear that the risk of conflict in the region is higher now than when the President took office,” he claimed, citing the killings in Benghazi, the Syrian civil war, “violent extremists on the march,” and tensions surrounding Iran’s nuclear programme. On specific policy recommendations, however, Romney failed to substantially distinguish his own from Obama’s. Indeed, in contrast to recently disclosed off-the-record remarks to funders in which he indicated that the Israeli-Palestinian conflict was likely unresolvable, he said he would “recommit” the U.S. to the creation of a “democratic, prosperous Palestinian state”, arguing that “only a new president” can make that possible. On Egypt, he promised to condition aid to the government on democratic reform and maintaining the peace treaty with Israel; on Libya, he said he would pursue those responsible for the murders of U.S. diplomats. On Iran, he promised to impose new sanctions and tighten existing ones, as well as build up U.S. military forces in the Gulf; on Afghanistan, he said he would weigh the advice of his military commanders on the pace of withdrawal before the end of 2014. On Syria, he promised to work with Washington’s partners to “identify and organise” opposition elements that “share our values” and ensure they get the weapons needed to defeat Assad. In each case, he suggested that Obama’s policies were less forceful but did not explain how. Mr. Romney is hitting below the belt when he criticizes Obama on the Middle East. He’s playing in the ignorance of some segments in society by trying to indirectly remind them that there was talk about Obama Muslim links that clouds his policy toward the Middle East and Israel. The president has advanced the interests of the USA effectively and managed to not end up on the wrong side of history when it comes to the Arab spring, while still protecting the camp David accord between Israel and Egypt. Blaming president Obama for the turmoil in the Middle East is like blaming president Bush for 911. Being there when things happen doesn’t necessarily make them your fault. Obviously, Romney and his followers don’t know the full story of Obama’s delicate situation as an “unofficial” world leader trying to create harmony. Those who look for susbtance will certainly vote for Obama. 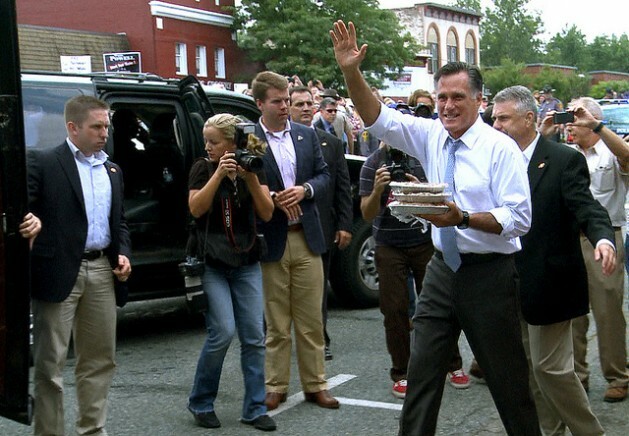 The more Romney exposes himself, the more he is destroying his own integrity. I think that Obama is handling world politics quite well, with wisdom and diplomacy. Can Romney do better in world affairs? “The president has advanced the interests of the USA effectively”… Where exactly? Obama’s fecklessness on the international stage is not leadership… Sorry. There are many examples that would take pages to write, but for the purpose of this discussion, let’s take Libya. The Libyan regime was not defeated when the US came on the side of the people. By acting in support of the Libyan revolution early and decisively, the president ensured that a large segment of the population benefited directly from US action, and in doing so improved the Image of the USA in Libya. Despite the events in Benghazi and the tragic killing of Ambassador Stevens, the long-term benefits to the US are tremendous, in terms of rehabilitating the US image in the region. In fact, the ambassador’s heroic sacrifice (by being there in the thick of things instead of hiding in Tripoli with a large security contingency) will go a long way in consolidating the US gains in the region. I expect that you will find streets named after Ambassador Stevens in Libya, including the street where the consulate once stood. Libyan oil didn’t go offline for years as a result of a protracted civil war and sanctions, at a time when the US was pushing to limit Iranian oil exports at a time of global recession. Also, the US intervention means that we have a hand in the pie, not allowing the Islamists to take all the glory for wining the revolution and by extension taking over the government, without any US secular allies to counterbalance the Islamists’ influence. Compared to starting two long term wars, one of which was with the wrong country, I’d say the Libyan achievement alone is a pretty good record for Obama.